At last, we can view the proposal from the R&A and USGA that would prohibit anchoring the club (typically a long-handled putter) in making a stroke. I emphasise that these are proposals, which even if they are implemented (highly likely), it will not be until 1st January 2016, over 3 years away. The proposed change to Rule 14-1b would not alter current equipment rules and would allow the continued use of all conforming golf clubs, including belly-length and long putters after that date, provided such clubs are not anchored during a stroke. Personally, I welcome the proposals, albeit that I consider them belated by several years, but leave you to make up your own mind. I strongly recommend that you view the proposal, together with video and illustrations of what constitutes anchoring and what does not. 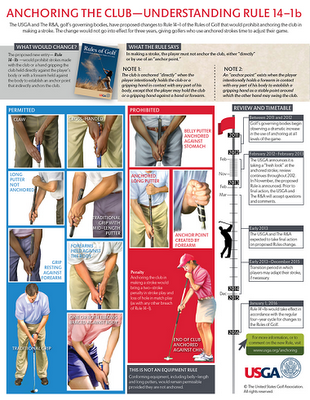 NEW: My ‘99 Tips on Using the Rules of Golf to Your Advantage’ (previously published on DVD) is now available as a downloadable .pdf file, which can be read and printed out from any computer. More details and a link to specimen pages here. Only $8 (or equivalent currency); less than 10c per tip! Barry, Just bought a mid length counter balance putter. it is not anchored or intended to be anchored to chin/stomach. When i use it if i wear a rain jacket or wind shirt it looks like it is anchored although not touching my belly. I.E. saggy clothing with a little belly make it look like it could be anchored! It is ok when i wear a t-shirt! If it is touching my clothing is it anchored? Did you read the links in the blog to the R&A and USGA explanation and the accompanying pictures on what will be permitted and what will not? It is a question of fact whether the player intentionally holds the club or a gripping hand in contact with any part of his body, except a hand or forearm. So, just because the putter touches your baggy clothing does not mean that you will be breaching the new Rule from 1st January next year.